The PD42 is a dependable and versatile printer suitable for medium-duty applications in manufacturing, transportation and warehousing environments. Smart, strong and secure, the PD41 with tamper-proof, one-button user interface meets the needs of medium duty applications. Its multiple communication interfaces, secure wireless connectivity, CCX and WiFi certification, and support for IPv6 ensure easy integration and scalability. Stand-alone Smart Printing eliminates PC costs and complexity, and enables quick ROI. The PD42's integrated device management and diagnostic capabilities, provided through Intermec SmartSystems - and Wavelink Avalanche -, reduce downtime and simplify deployment. With user-selectable, all-in-one programming languages (Fingerprint, IPL, ZSim, DSim, ESim), the PD42 fits existing IT infrastructures, deploying with drop-in simplicity to Intermec or mixed printer environments. Secure, industry-standrd connectivity options support easy integration and fast deployment. Multiple interface options are available, including the highest level of secure wireless connectivity (WPA2). The industry's only printers available with WiFi- and CCX-Certification, Intermec industrial printers help maintain wireless network integrity and reduce configuration time. Every printer ships with Ethernet connectivity, as well as with emerging network protocol IPv6, ensuring long-term, enterprise scalability. Other connectivity options - standard RS232 and USB ports, optional parallel port - provide additional integration flexibility. The standard CompactFlash - memory slot is complemented by new USB host and device support. Handy, inexpensive and PC-compatible, CompactFlash and USB memory technologies provide extra storage for Fingerprint programs, layouts, graphics*, fonts and firmware upgrades. TCP/IP-suite (TCP, UDP, ICMP, IGMP, etc. ), LPR/LPD, FTP, BOOTP, DHCP, HTTP, SNMPv3, SMTP. SNMP-MIB II supported (over UDP/IP), private enterprise MIB included. Supports IPv4 and IPv6. 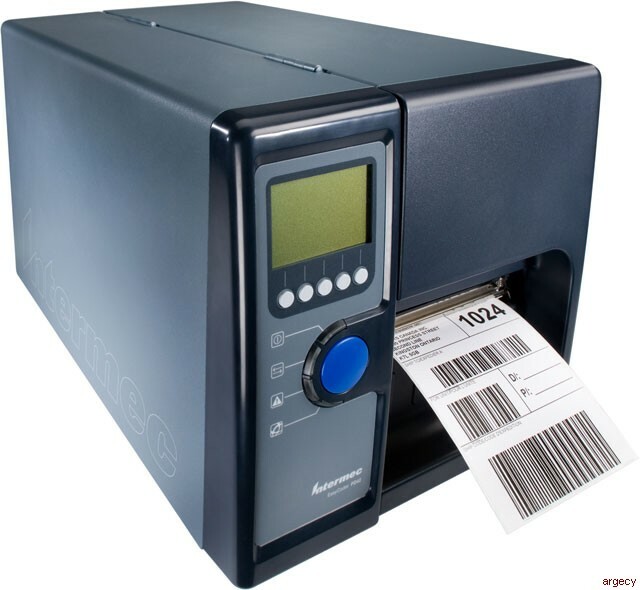 Direct thermal and thermal transfer label, ticket and tag printers. All major 1D symbologies are supported. All major 2D symbologies are supported.